The following information will help acquaint you with the most important rules and regulations pertaining to materials circulation. In order to serve every patron fairly and as best we can, it is necessary for the library to enforce these regulations consistently. If you have any questions regarding them, our staff will be happy to help. Service Policy Changes for 2019 are now in effect. Read our all of our policies here. 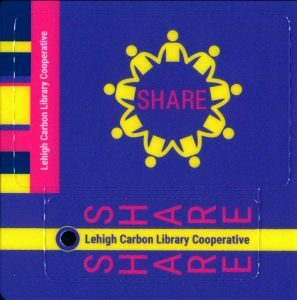 For more information on the Lehigh Carbon Library Cooperative click here. CHECK-OUT: A valid, current library card is required for check-out. As a courtesy, your card may be looked up upon presentation of a valid photo ID & a $1 fee. A receipt is given to each patron with the borrowed items listed, showing the due date and title of each item, at the time of check out. BORROWING TIME: Most items circulate for a three-week period. DVDs, Juvenile Holiday books, and periodicals circulate for one week. New adult books marked as such circulate for 14 days. Current editions of periodicals and reference materials do not circulate. Reference Materials are available for in-library use only and may be duplicated in accordance with copyright laws. LIMITS: During check-out, some items are limited by quantity: DVDs- 7 per borrower, Juvenile Holiday Books- 5 per borrower. We ask that you do not take an entire author or subject matter’s holdings. RENEWALS: Items may be renewed at the library with your library card, or by telephone–call the library at 610-965-2272. Please have your library card number (found on your card under the Emmaus Public Library bar code OR on the slip issued at check out) and titles to be renewed on hand. You may also renew on-line using your library card number and PIN number. Items on reserve by another patron & Juvenile Holiday books may not be renewed. OVERDUE FINES: Overdue fines are charged on materials returned past their due date at the rate of 25 cents per day per text item. DVDs, VHS, music CDs and audio books on CD or MP3 are 50 cents per item per day. Lost items are assessed at the cost of the item plus a $3.00 processing charge. Inter-Library Loan items are $1 per day. RESERVES: Any item in the library which circulates may be reserved. Items may be reserved in person at the library, by telephone at 610-965-9284, or through this website by clicking on the “Catalog” link at the top of the page. For reservations by phone, please have your card number and the title you are requesting available to help use serve you. MOVIES AND MUSIC: Most DVDs may be checked out for 7 days. DVD sets (such as TV series or special events) circulate for 14 days and Music CDs circulate for 21 days. OTHER CHARGES: Charges for damages will be assessed for each item that requires repair or replacement. This includes, but is not limited to, damages to barcodes, plastic cases, tapes, books, and any other part of a library item. The minimum charge is $1.00, the maximum is the cost of the item + $3.00 for processing. Inter – Library Loan items which are not picked up are subject to a $1 charge per title. The Emmaus Public Library’s Internet access is provided to the public as part of the library’s information service. Patrons are encouraged to explore the Internet on their own or with help from the library staff. The library provides Internet access with workstations for public use. Wireless access to the internet is available for patrons who have their Wireless-enabled devices. The library does not provide public access to subscription services or access to direct personal communication services, such as chat lines. Introductory overview classes on how to use computers, software, or the Internet are offered occasionally. The Library does provide access to some research tools with your library card and PIN. For more information on our online research tools please ask at the Front Desk. All patrons using network resources in the Emmaus Public Library must exhibit a willingness to limit time on computer systems. Internet users are expected to use the Internet as an educational resource. The following procedures and guidelines are used to help ensure appropriate use of the Internet at the Emmaus Public Library. accordance with the policy of the Emmaus Public Library. 3. A professional library staff member may override the technology protection measure that blocks or filters Internet access for a minor to access a site with legitimate educational value that is wrongly blocked by the technology protection measure that blocks or filters Internet access. Wireless access is available to all library guests during business hours. No library card or ID is required, though you must enter a password to connect. The password may be obtained at the Front desk. Guests are expected to comply with the Emmaus Public Library’s Internet Public Access Policies at all times and use the network in a legal and responsible manner. Use of the library’s wireless network is at your own risk. Our network is in compliance with and meets the requirements of the CIPA – it filters all internet usage and may block websites, links, or uploads & downloads. Read our full policy: Internet Access and Acceptable Use Policy 2017. In January 2019, after many years of coordination and cooperation, Emmaus joined with 10 other libraries to form the Lehigh Carbon Library Cooperative (LCLC). The LCLC gives patrons access to 11 libraries’ collections with one barcode, including the options to reserve and pick up or return materials, renew their library card or register for a new LCLC card at any participating library. LCLC libraries have coordinated borrowing policies, billing standards and card registration procedures to create a seamless experience at any of the libraries. To upgrade to the new LCLC card, please bring your existing library card & photo ID in to upgrade to this new resource. If you need helping please feel free to stop by the front desk.You can find the full policies and rules here.